The confusion about what is healthy to eat and what is not so healthy is still a big problem for people. And BTW, I’m not picking on Starbucks at all. This diet and nutrition confusion happens everywhere… The diet confusion happens at the grocery store, at the local restaurant… It simply is confusing for people where ever food is sold. First, Southern California has had an extremely cold snap with tons of rain and even hale… very cold for us. And my husband and I were downtown after church yesterday and in our freezing weather we’ve been having, we wanted to grab a warm cup of tea before heading over to the mall to meet some friends. And since there’s a Starbucks on every street corner of the world (or so it seems) we easily found one and got in line. While in line, I picked up what is often thought of as a super healthy snack–a fruit and yogurt parfait–and I passed it to my husband to ask him to read the ingredient and nutrition list for me just for fun. Okay… Guess how many grams of carbs and sugar in this tiny container? 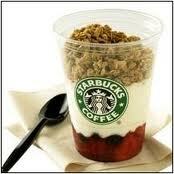 Well, this little “healthy” fruit and yogurt snack from Starbucks (a whole 8 oz serving!) packs FIFTY FOUR grams of carbohydrates (processed carbs) and THIRTY ONE grams of sugar with additional sugar and syrups added in FIVE different places on the ingredient list! I know I attracted a little attention with my gasp of surprise and exclamation of “oh my gosh”. For me it’s so sad and frustrating because most consumers are real victims of… And the price people pay is in their health… the biggest price of all. Most people who want to be healthy and fit and eat the right thing are likely to choose the “fruit and yogurt” snack over the piece of cake or pastry anywhere they are, but they still end up eating pure junk. And they don’t know it…this is the tragedy. Mix the greek yogurt with the protein powder and stevia until well blended and top with strawberries and blueberries. makes this delicious snack taste like yummy pudding. 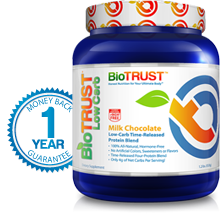 And trust me, BioTrust low carb protein has no added garbage or artificial sugars. Everything in this healthy protein powder supports your fitness and fat loss goals. If you’d prefer to layer like a conventional parfait, start by placing 1/2 the yogurt in a small glass and then top with the blueberries. Then place the rest of the yogurt and finish off with the strawberries. If you like a little crunch, add some raw sunflower or pumpkin seeds, or unsweetened shredded coconut. So delicious and so much more healthy than the fake food offered in public places. Also, this snack provides triple the protein of the Starbucks versions and less than 1/3rd the carbs and sugar. Take the confusion out of healthy eating and dieting and get a healthy whey protein powder you can use in your post or pre workouts, your healthy dessert recipes, even on your healthy oatmeal in the morning like my husband does.